Derek Cooper of Kingston Aerials, his pilot Wesley Gurr and operator Kiyavash Parvar visited SEARC recently with their custom-built, heavy-lift drone. The drone has a flight time of 25 minutes and can cover 25 acres in this time. The payload is customizable for specific applications. For the visit to SEARC, the drone was equipped with an RGB high-definition camera and a coaxial-mounted infrared camera. 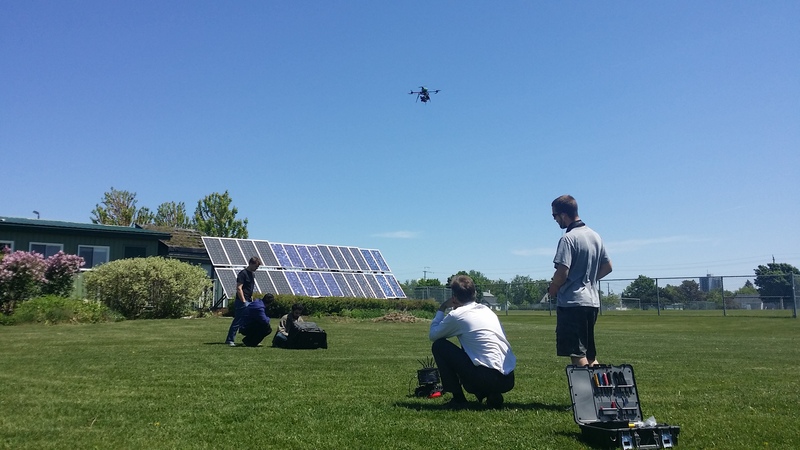 The drone was flown over the Open Solar Outdoor Test Facility (OSOTF) and Energy House solar arrays to test the infrared camera’s ability to detect disabled or malfunctioning photovoltaic panels.